With a holiday home like Bacaya Villa, you’d be hard-pressed to step out of the compound. Boasting an infinity pool, well-manicured lawn and a beachfront location, the home features all the essentials of a dream vacation home. With three bedrooms in total, Bacaya is ideally set up for couples or small families. Bacaya houses six guests in three bedrooms. The master bedroom enjoys uninterrupted sea views and a beautifully appointed en suite complete with TV lounge and outdoor sunken tub. The interior is kitted out with all the essentials for rest and relaxation, like a TV, quality linen, block out curtains and glass doors that can be pushed out to bring in the sea breezes. While the guest bedrooms doesn’t boast a seafront location, it enjoys similar furnishings and offers access to a private terrace with garden. Bacaya boasts an incredible outdoor space - there’s a neatly manicured lawn dotted with palms, sparkling infinity pool, a row of recliners facing out to the sea and sala. 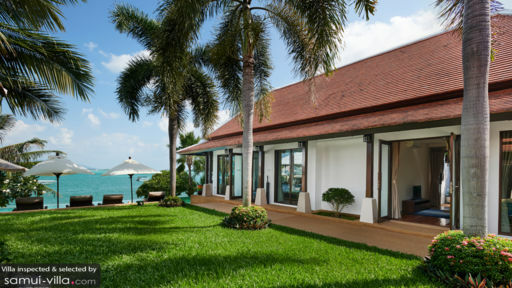 Ideal for social gatherings or private relaxation, guests will enjoy mingling by the poolside with cocktails, tucking into al fresco dinners out on the lawn or settling down for shaded siestas in the sala. A private gate provides direct access to the beach. With vaulted ceilings and full-length doors that allow ample sunlight to spill in, the common spaces at Bacaya Villa feels welcoming and airy. Set in an open plan layout, the indoor lounge, dining area and kitchen merges seamlessly together. Air conditioners ensure comfort indoors in the balmy weather of the tropics, but on cooler days you’ll have the option of opening up the glass doors for indoor-outdoor living. The red sofa set is an eye-catching addition to the indoor lounge, and complements the neutral colour scheme of the room perfectly. Next to the lounge is a six-seater dining set completed with decorative tableware. The dining area extends out to include an open kitchen that’s chic and modern, with sleek black countertops and cabinetry alongside a full range of cooking appliances. Daily breakfast, along with housekeeping and security services are included with your stay. Airport pick-up car rental, driver are available at additional cost, as are babysitting, private chef, personal guest assistant and in-villa massage services. Despite its sense of tranquility, Bacaya Villa enjoys close proximity to local amenities and attractions. 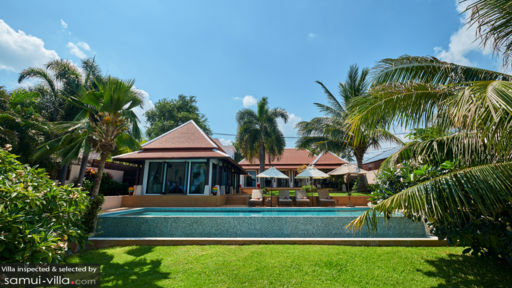 Bo Phut Beach, a favourite hangout among families is eight minutes’ drive from your villa. Round out your day at the beach with shopping and dining at Fisherman’s Village Bophut. It’s just a skip away from the beach, and offers plenty of options for high-end dining and shopping. It’s easy fitting in cultural sightseeing into your itinerary when attractions like the iconic Big Buddha, Wat Plai Laem and Wat Bang Rak are located a quick drive away. 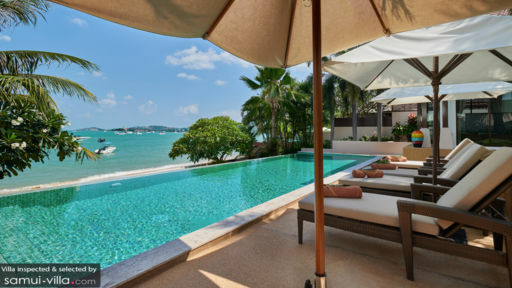 There’s also The Yogarden Samui (six minutes’ drive) for group yoga classes, Boutique Yachting for island tours and private charters and Zazen Boutique Resort & Spa for decadent spa treatments. Getting a private chef at Bacaya Villa makes for an incredible dining experience. But there’s plenty of great options around too, like Orgasmic for fusion food and Barracuda @ The Wharf for some of the best seafood in town. Unwind with a nightcap at The Crow’s Nest or Elephant Beach Club.